What Happens To Wildlife After A Tsunami? After a magnitude 8.2 earthquake struck Chile yesterday, the Pacific Tsunami Warning Center issued a warning for Chile, Peru, Ecuador, Colombia, and Panama. While it's still too early to know how the wildlife along that stretch of Pacific coastline fared - let alone how our own species fared - we can look to previous tsunamis for a clue. The BBC has reported that high waves hit the Chilean and Peruvian coasts some 45 minutes after the initial quake, with some reaching as much as 2 meters (6.5 feet) high, prompting evacuations along the coasts in both nations. But unlike people, animals don't receive evacuation orders. So what happens to them? 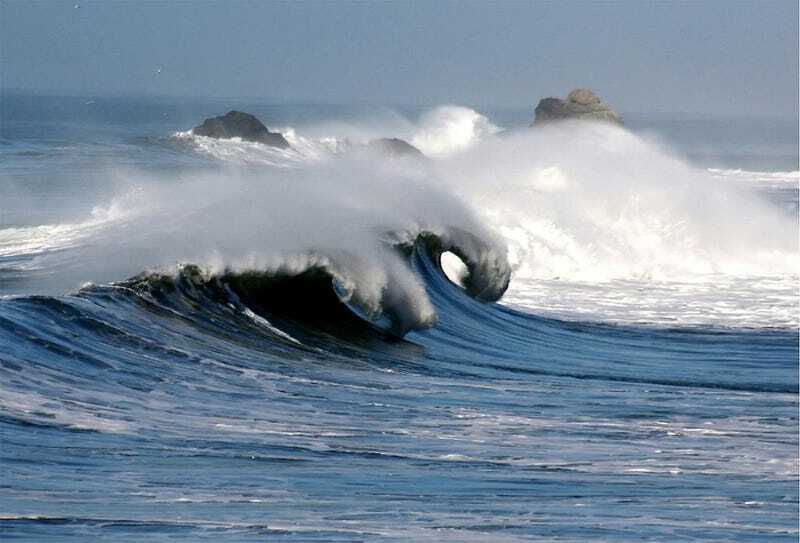 More in-depth research into the short- and long-term effects of the tsunami on marine and coastal ecosystems along the Pacific coast of South America will take time. But the 2004 magnitude 9.15 earthquake off the coast of Sumatra, and the resulting tsunami that rippled across the Indian Ocean has been extensively studied. There was also some information collected following the 2010 Chilean earthquake. That allows us to speculate regarding possible outcomes of the current Chilean earthquake and tsunami. One of the most interesting outcomes of the Chilean earthquake was the changing heights of sandy beaches. Those beaches that become more flooded were opened up for colonization by intertidal species, those who are submerged at high tide and exposed at low tide, while those beaches that were raised meant that intertidal species had to retreat. No matter which way the shoreline went, some animals were displaced and others took up residence in their place. The result was a complete rearrangement of coastal ecosystems. While some data has started to come out of assessments done after the 2010 Chilean earthquake, the intervening decade since the one in Sumatra has meant that scientists have had more time to collect data and interpret their findings. The Wildlife Trust of India, along with the International Fund for Animal Welfare initiated several investigations following the earthquake and tsunami to assess their impact on wildlife. Overall, they found that damage to wildlife populations was generally limited on the mainland, and slightly worse on the islands. Particularly hard-hit, however, were coral reef systems. Several beaches were washed away, and freshwater habitats were inundated with saltwater. While most of these ecosystems were eventually able to rebound, problems did occur. For example, one mainland wildlife sanctuary became flooded with saltwater and covered with sand, making is impossible for the various plant-eating ungulates to graze. Even worse, with seawater comes toxic pollution. Other grave problems stem from the onslaught of seawater laden with sediments and toxins. Aquifers, the primary source of drinking water, have been contaminated by saltwater, raw sewage, oil, and other pollutants. On the coasts of Indonesia and Sri Lanka, paddies and farm fields are smothered under a crust of salt and silt. Some areas may never recover, for others irrigation and one or more rainy seasons may be enough to flush out the soil. For now farmers are being encouraged to plant salt-tolerant crops, like pumpkins and kale. In other areas, rather than covering plants with saltwater, the tsunami simply washed all plants away, making it possible for invasive species to quite literally take root. The change in plant life wasn't problematic for some species, such as the fan-throated lizard (Sitana ponticeriana), which were able to survive in the new ecosystem. Other species who were specialized for the native habitats were surely less lucky, but hard data is scant. And there were probably other invaders, as well. Furry ones. Large dead trees from distant islands were found washed up on mainland beaches. While there was no danger to beach ecosystems from the trees themselves, since they were dead, they may have carried some critters with them that would eventually colonize mainland coasts. It is well-known that rodents, reptiles, and insects are quite capable of setting up camp in new environments after rafting across the sea. Even lemurs. This creek used to be a local birding area that attracts a large number of migrant waders and the blackwinged stilt (Himantopus himantopus). A few years ago, the Chennai Corporation as part of an effort to beautify the city had dredged and deepened the creek. The waders that had since left the creek had made a re-appearance after the tsunami brought back all the silt! Other birds didn't do so well. As with any bird species, maintaining constant temperature is critical for proper development of the birds within the eggs. For birds who rely on external heat to warm their eggs, however, the flooding of the nests by cold seawater became problematic, especially for those nests that were closest to the water. Many of the birds that did survive relocated into the interior of the island, settling into evacuated villages. But when the villagers began to return, they were not happy to find the birds nesting around their homes. Even worse, the main source of income for these villagers came from coconut plantations, were were almost entirely washed away. As a result, the villagers turned to hunting and fishing in order to survive, further impacting animals and ecosystems. The effects of a disaster like a tsunami on wildlife can reverberate. As for shallow water fish, it was initially assumed that the tsunami would be beneficial. Researchers hypothesized that the dead and decaying material in the sea would result in a huge growth in plankton populations. This hypothesis was later confirmed, when scientists observed massive increases in plankton-feeding fish species, like sardines. Increases in fish populations, coupled with reductions in motorized boats in the area, brought more dolphins to the coastal waters as well. There was more good news, for the sea turtles of Sri Lanka. Initial reports had confirmed that there was extensive damage to nesting sites, hatcheries, and adult foraging habitats due to the tsunami. However, the number of nesting females, at least at one site, remained unchanged in the following year. It is possible that the adults were simply at sea when the tsunami hit. The good news for these turtles should be understood in context, however. The researchers were quick to note that most sea turtle species in the region were already endangered, and that "the fate of sea turtles in the region is more likely to be determined by long-term human influences than by infrequent natural catastrophes." Even if a given species isn't directly affected by a natural disaster, there are often repercussions due to the complex interactions among different species, between plants and animals, and between predators and prey. Rather than asking about the outcome for a specific species, it makes more sense to ask about the health of larger ecosystems, in the wake of a tsunami. In the 2004 tsunami, coastal ecosystems fared worse than more interior ones. And human behavior plays a critical role in determining how an ecosystem rebounds from a disaster like a tsunami. It was partially due to a moratorium on fishing following the 2004 tsunami – one that people generally respected – that allowed the sardine populations to thrive in the plankton-rich water, which allowed the dolphin populations to thrive, in turn, on the sardines. On the other hand, when fisherman turned to hunting, birds suffered. While the tsunami might not have been terrible for the sea turtles, they were endangered to begin with, thanks to human activity. As devastating as natural disasters can be to natural ecosystems, they are nothing compared to the long-term effects of human behavior. Portions of this post were adapted from an earlier article written following the 2011 Japan earthquake and tsunami. Header image: Brocken Inaglory/Wikimedia Commons.